“Make do and mend “ is back in vogue! Clothes go in and out of fashion very quickly and even when our favourite pieces have become worn and tired we can still be still reluctant to let go of them. A solution to the problem of a dated or underused wardrobe can often be achieved by customising garments, and with the imaginative use of accessories. Having a varied wardrobe for little expense can easily be achieved by making a few alterations to garments, through creative embellishment, and with clever use of accessories. We can advise on how to revamp your wardrobe in a cost-effective way using existing key garments. 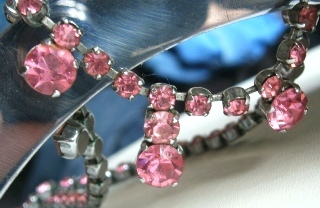 If you require help with the sourcing of vintage accessories from the 1930s - 1970s, for example: jewellery, bags/belts, hats/scarves, then we can be of assistance - please contact us with your requirements. We can assist with a Wardrobe Declutter - when your closet won’t close - you know it’s time to take action! Personal Shopping too - whether for a capsule wardrobe, a seasonal update or a whole new style and look! We can also arrange for unwanted items to be donated to your chosen charity shop, to be sold or disposed of.